When we went for a wedding last December, the restaurant served this Osmanthus Flower and Goji Berry Jelly as dessert. Papa said can actually make this at home. So one fine day Mamarazzi dug out the sad looking Osmanthus Flower from the fridge. Think maybe expired kot but when she smell it...still strong smell of the flower. I dug up my jelly mould pulak but Mamarazzi said don't wanna use these la. 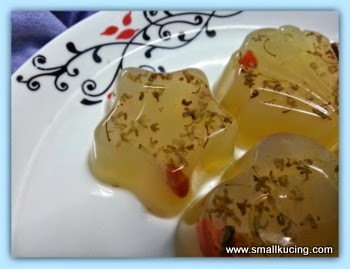 Wanna try out the jelly mould that she bought some time ago from a closing down sale pulak. 1. Boil the water till it's boiling and add in the jelly. 2. 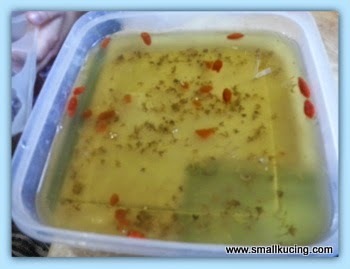 When the jelly is fully disolved, add in the Osmanthus Flower and Goji. Kept it boiling in small/slow fire for another 5-10minutes. 3. Turn off the fire, add NuStevia Simple Syrup into the jelly. Stir well before scooping the liquid into the moulds. 4. Put into fridge to chill and wait till it's harden before serving. This one was for Papa. Heard it's good for cough wor. While these cute ones are mine. 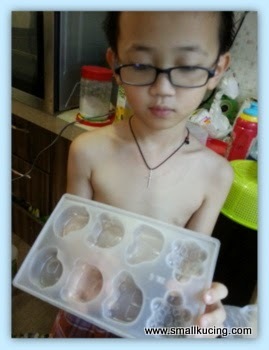 Jelly is very nice and cooling. I like! So pretty! Wow, your mom and dad are BOTH good cooks! You must watch and learn from them. The jelly looks really pretty.. The Osmanthus Flower looks ok wor, very nice, once hardened in the jelly, looks very nice and refreshing.. Hmm, one day I might try with chrysanthemum.. Good for heatiness too.. wah!! really did that at home!! when Uncle SK read that post about the wedding dinner and Paparazzi told Mamarazzi can make it at home, Uncle SK already thought Mamarazzi sure wanna try to make this at home.. bingo!!! apalah ni Mamarazzi, Small Kucing wanna use his cute cute jelly mould but Mamarazzi pulak said cannot and "die die" must use her new mould bought from the closedown sale pulak!! hahahaha.. sekali, she didn't eat herself ke?? cos only mention the portions for Paparazzi and Small Kucing.. I love the taste of this Osmanthus Jelly. So fast Mamarzzzi made it for you to eat. Mamarzzzi can open a booth at Jaya One and sell this jelly. Sure roaring business to be the first! Wah...this jelly looks like the real deal! After seeing this, I also want to go and make them now. Small Kucing, you are so blessed. Your mom can cook and make such cute and tasty jelly for you. Wah! I want some of those! Very pretty, the designs in the jelly. Yes this is very good, osmanthus is well known in dessert and skin care. Hoe yeh wor!! Looks good too.. for my sore throat! Small kucing is so lucky to have a Mamarazzi of his own who can do all sorts of cooking. These jelly really looks refreshing to eat. I like the one in shapes one, is much cuter!! I too don't prefer Konnyaku Jelly powder. Never heard of the flower and where to buy. Nice dessert. Where to get Osmanthus Flowers, Kathy? Fat Man Lok Lok Truck - New Year Celebration.